I’ll walk you through the process step by step, but you can also see the full code for the project on GitHub. I also recommend you refer to the Power-Up documentation before you begin. Let’s get started with GitHub. If you don’t have an account, you can create one at github.com. Once your account is created and you are logged in you will also need to set up your GitHub Pages website since that is where we’ll be hosting our Power-Up. Follow the instructions at pages.github.com to set up GitHub Pages. Now when you create a new GitHub repository it will be hosted at https://yourusername.github.io/your-repository-name. Pretty cool, right? Now that GitHub is set up, let’s get started with the Power-Up! The easiest way to start building a new Power-Up is to fork Trello’s template project which is a full featured sample Power-Up. Go to the power-up-template repository and click the “Fork” button in the upper right corner of the page. I gave my fork a new name (youtube-power-up) and description. Then clone the repository to get a local copy. I like working with GitHub Desktop. Be sure to add the YouTube icon to your images folder. When you’re done with your edits, push your changes to the manifest and the new icon to GitHub. Now we’re ready to create the new Power-Up in Trello. If you don’t already have a Trello account, sign up for one at trello.com. Since Power-Ups are associated with teams, you’ll also need to create a new team. You can do this by clicking the “Create a new team…” link underneath your boards. Click save and your new Power-Up will show up in the list of Power-Ups. Now that our Power-Up has been created, let’s go to our boards so we can add our Power-Up and see it in action! At this point it will have the template functionality, we’ll implement the YouTube code later. 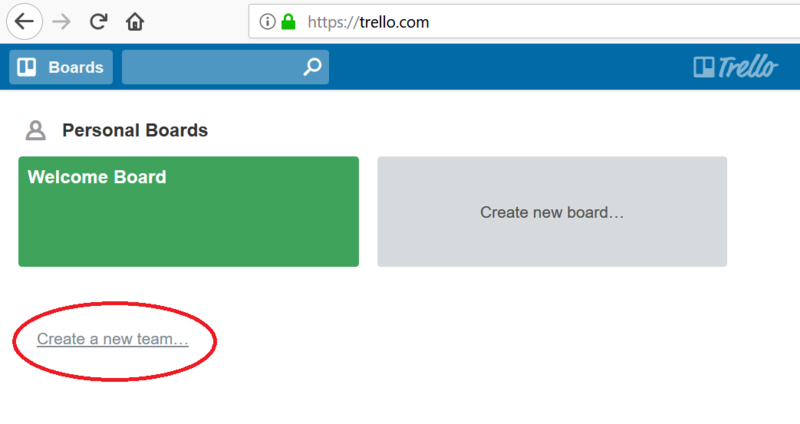 To add the Power-Up to a board, go back to trello.com and if you haven’t already created a board for your team go ahead and do that now. Then click on your board to open it. To add the Power-Up, go to your team’s board and choose “Power-Ups” from the menu. Scroll down and you should find the new “YouTube” Power-Up in the list (it is sorted alphabetically). Note that the name, details, and icon you see in the Power-Up list are all coming from manifest.json. 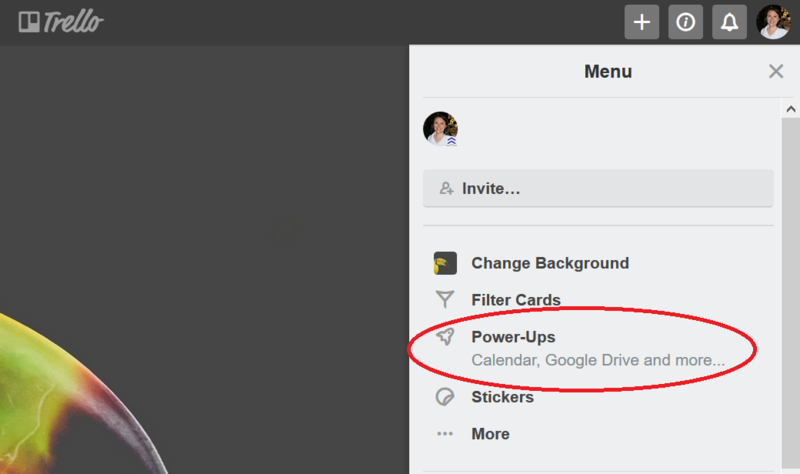 Click “enable” to enable this Power-Up (if you are using the free version of Trello only one Power-Up is allowed per board so you may need to disable another Power-Up first). I’ve noticed it can take anywhere from a few minutes to a few hours for the Power-Up’s icon & description to show up in the list, so don’t worry if all you see is the name at this point! Likewise there is some lag before the Power-Up is available in your cards. In the meantime, we can get started on other parts of our project. We will be using the YouTube Data API to search for videos. Before we can connect to the API, we’ll have to set up credentials and grant access to the YouTube Data API. 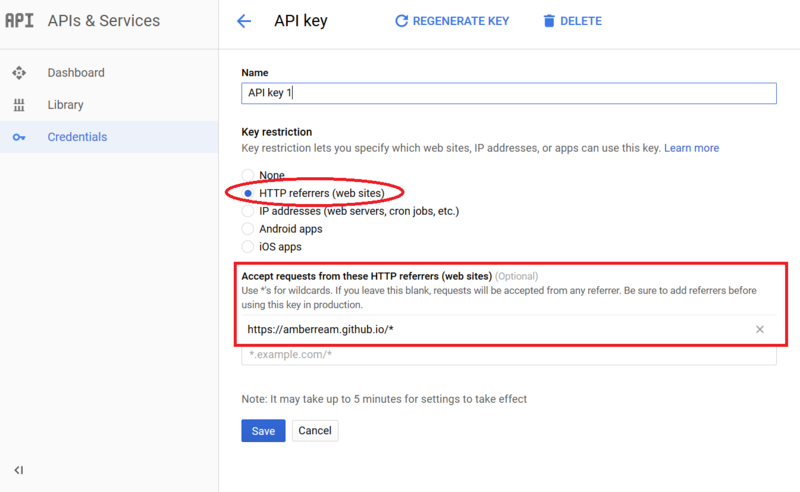 Make a note of your API key because you’ll be using it soon, and please remember to restrict your API key! For example, I chose to only allow YouTube requests coming from my GitHub Pages site. Now it’s time to make our Power-Up do something! But first, a little set up. Since I like to use jQuery for ajax requests, I’m going to import it in index.html. Next, since I have a custom icon that I would like to display for the YouTube Power-Up on the back of the card, let’s drop the gray play button icon in the images folder. You may remember defining card-buttons, attachment-sections, and callback in manifest.json. Let’s take a look at how those are used in client.js. We don’t have to define anything specifically for “callback” here, but you can read more about why we need the “callback” defined in the manifest here. We’ll start by adding a button to the back of our card. In client.js, find the ‘card-buttons‘ function inside TrelloPowerUp.initialize. We will need to define a button that will trigger the YouTube Power-Up. We’ll give it an icon, text, and a callback function that will be called when the button is clicked. This button will be using the gray play button icon, so you’ll need to update the GRAY_ICON constant at the top of the file to refer to the gray icon you just added to the images folder. Now we need to define the youTubeButtonCallback. This is where we’ll display a popup so the user can search for a video on YouTube. We’ll make requests to the YouTube Data API as the user types and then return a list of results that will get displayed in our popup. In the code below we’re using jQuery to make a request to the YouTube Data API to get a list of results based on what the user has typed into the search box. Each result contains “text” and “callback” properties. The text is what gets displayed in the list, and the callback is the function that gets called when an item in the list is clicked. In this case, we want to attach the YouTube video to the card. Remember to update the YouTube key to your own key which you created above or searching will fail! Since we are interested in embedding YouTube videos, we're filtering for urls that begin with "https://www.youtube.com". For each video we find, we're adding a new iframe and adding it to the videos div that we defined in section.html. Finally, we need to update the "attachment-sections" function in client.js. // include in your section. // per attachment, or anything in between. As in section.js we need a filter for urls that begin with "https://www.youtube.com" because these are the only urls we want to include in our YouTube attachment section. The "id" will be the name of the attachment section, and the "icon" will show up next to the name. We are using the standard YouTube icon here, so we'll need to create a constant at the top of our file that points to the red YouTube icon. You're done with the hard part! Since we cloned this project from the sample codebase there is a lot of code we don't need, so let's delete it. Starting with client.js, there are several hooks defined that we're not using. You can delete everything except "card-buttons" and "attachment-sections". In client.js we can also get rid of the callback functions we're not using (just be sure to keep the youTubeButtonCallback). That's it! 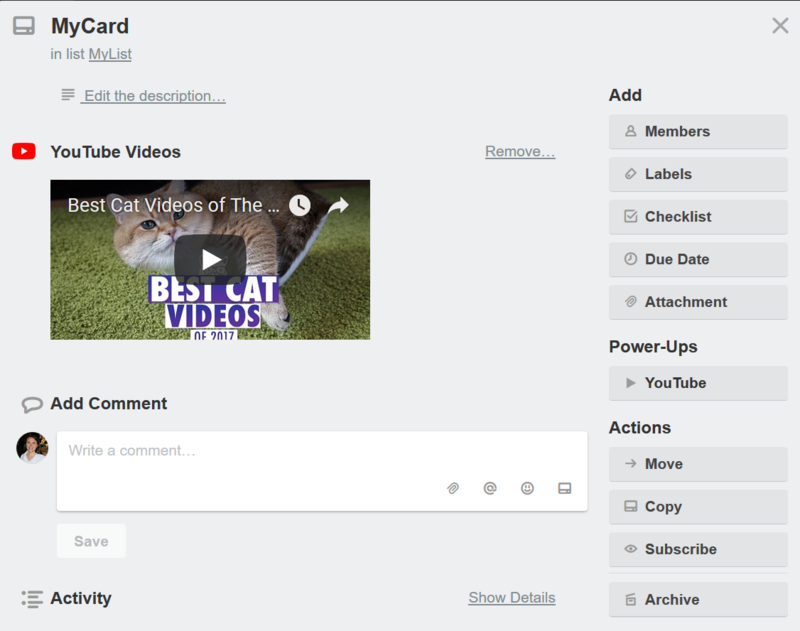 Go back to trello.com, open up your board, and if you don't already have a card you should create one. Then when you edit your card you will see the YouTube button on the right side of the card under "Power-Ups". When you click the button, the search popup will come up and you can start searching for a YouTube video. Click on the name of the video you want to embed, and Voila, it will appear near the top of your card under the YouTube heading. Congratulations on completing your YouTube Power-Up!